By now people are familiar seeing photos of dead cattle, sheep, elk, horses, whatever, all supposedly by killed voracious wolves. Some are eaten, some not. Either way the amount eaten is put forward as evidence that wolves are incredibly hungry or not hungry at all and kill for fun. We exposed this deception some time ago. The only sure thing about these photos is that the animals are dead. Some were obvious frauds, clearly not even taken in the United States. Most, there was no way to tell. While this “politics by carcass” has continued, a new method of photography has developed. They are of people posing huge wolves they shot, photos of “close friends” posing with huge wolves they shot near where you live, and finally huge wolf packs near where you live. Let’s take the later first. About two months ago I got a photo of a long line of wolves (25) trailing through the snow near Kamiah, Idaho, according to the sender who was alarmed. It didnt look like Kamiah to me though. The photo kept popping up, but its location was never the same . . . maybe Idaho, Montana, Wyoming. I soon learned, however, it was taken in Wood Buffalo National Park in northern Alberta, stolen from a blog and circulated for political convenience. Finally, Idaho Fish and Game Department announced the photo’s true origin after it began to circulate in southeast Idaho where I live, and was being passed off as “near Soda Springs, Idaho,” where there is never more than an occasional wolf passing through. We see a lot of photos of people posing by wolves they killed in the hunt. OK. A certain number of them have learned a photo trick that turns an 80 pound wolf into one that looks like 200 pounds. If you do any photography with a wide angle lens (it doesn’t have to be very wide), you probably have learned about the wide angle lens size distortion when an angry spouse complains of the “fat” photo you took them. Wide angle lenses make things that are close to the lens appear abnormally large. To make your wolf appear huge, lay it flat in front of you, sit a foot or two behind it. Use the wide angle lens, but not so wide the edges of photo are distorted. That is a sure giveaway. Have your close friend take the photo. The wolf will look bigger than you, maybe a lot bigger. Note that you can use this to photo document your big fish tales too. Even better, remember that wolves have very long legs. They’re not like your typical Black Lab. In the winter they have a lot of fur, greatly expanding their apparent size. So take your dead wolf and hold it by its legs or with its legs dangling down. Be sure to hold the wolf in front of you (remember the wide angle effect). Amazingly your wolf will probably look almost as tall as you and heavier too with all that fur and paws as big as plates. It is surprising, however, how often people are not asked, “how did you pick up that 200 pound wolf and hold it?” Don’t tell them it was fairly easy because it weighed 75 pounds. Tell them you are very strong. You don’t hunt wolves? You can still impress or scare folks by using one of the photos going around of someone playing the tricks described above. You can also directly manipulate sizes using Photoshop, but that is more work and more talent than needed. Most folks will stick to the methods above. Sit at the side of the wolf. Use a normal or short telephoto lens. The relative size will be accurately recorded. A good example of wolf fraud photography. No it isn’t photoshopped. It is just that the camera is closer to the wolf than the man, and wolves also have very long legs. Update. 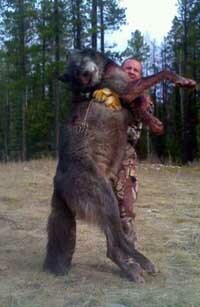 Most people have probably seen this “monster” wolf by now. Here is more on the photo. I’m sure you also heard that the 25 member wolf pack photo was “seeded” by pro-wolf folks in order to create the hysteria that the anti-wolfers have generated through the photo. Why would “pro-wolf folks” want to “seed” such a photo? Why would they want to give ammunition to the “anti-wolfers”? That makes no sense at all. This picture popped up all over the place, including hunting forums. Many comments were made as the image was proof that enormous wolf packs existed in the NRM states. What it amounted to was much ado about nothing and served to question the credibility of the forums in general and the individuals who made the comments in particular. To save face, there was discussion in some circles that images like this were “planted” by prowolf folks. Regardless, the unfounded/unsupported comments are/were on the forums involved were pretty much proof in the pudding that much anti-wolf hyperbole is just that, unfounded. Thanks for this article and the links, Ralph. Great job on your recent stories on the myths about wolves. I have been calling it embellishment but I think myth is a better term. Most of the photographs depicting wolf kills are phony because, unless a necropsy is performed and recorded on a dead animal, the photo shows nothing more than a dead animal carcass. Animals die every day from all types of causes, not just predation. A large wolf weighs approximately 120-130 pounds, so even though the photos going around try to make them appear bigger – they are not. I make it a habit to track down photos of large wolf packs and so far, everyone has been taken by wolf scientists and researchers and then taken out of context by people in the public who use the photos to try and mislead people on the location of the pack for propaganda purposes. Keep up the good work in revealing all of the mis-information about wolves. I will make every effort to help you track down the truth about wolves, especially all of the phony wolf photos used to mislead the public. Subject: FW: Minnesota Timber Wolf… WOW!!! We have some big ones here. One of the Minnesota Power customer reps here says that this wolf killed two of her dogs. It accompanied the same photoshopped photo of a guy in camo lifting an enlarged black wolf, with pines behind that has been going around for years posted with various claims. Just tonight I read on a hunting forum about a 286 pound wolf that was killed up by Cascade, Idaho. Oh and on that same forum they talked about a woman up in Northern Idaho who was out archery hunting found herself suddenly becoming the hunted by a wolf so she put her bow and arrows down and pulled out her 44 magnum and shot the wolf at 10 feet as it was stalking her. Wow! I wonder, is this an example of a situation where the imagination is a dangerous thing? Very timely post, Ralph. Saturday night, I was out with a few friends. A guy was going around the bar with a wolf photo he insisted was from the Helena paper. It showed an impressive black wolf, hanging from its neck, most likely from a tractor bucket (not in photo). Background was some hay or straw bales. The claim was the wolf weighed 240 pounds, and suspended like that it stretched 6’8″. As usual, the hunter appeared in the frame with his rifle. The hunter was crouched down — weird, if the wolf was really 6’8″ long, you’d think the guy would want to stand up next to it for scale. I searched the Helena IR site and found nothing about this huge wolf. Thanks for the info on what you would approve in the way of a photo.. I know the culture is different out west, but I just can’t see it being so easy killing a k-9. All our dogs are decedents of wolves, coyote’s too. I remember someone on this site wrote in when his German Sheppard died,…. he cried like a baby. Our animals become part of the family, but their actions and their habbits are not that much different than coyote’s and wolves. Bears are linked into this too,… how they play with each other is a great site to see. I have a beautiful shot of one pawing the other in the face, it looks so funny. Last I was out west last March,in California, Arizona, and Nevada, I would love to visit up their again, and live their,but the killing I can’t take.I rather spend my money in California,where they try to save seals and etc, instead of hunting. I know this is speaking out of turn, but it is just me. Since the government added on the rider to the budget bill,it was all over for the wolf. My two senators opposed it and Frank Pallone opposed it too. I recently rec’d an email of a photo of a giant grizzly killed in CO. Although the photos were real, I’ve never seen a bear that big in the GYE let alone a griz in CO. It looked like a Kodiak bear, and by God, it turned out that it was! Lots of ‘fish stories’ going around as ‘fact’. Thanks so much for this article! I knew it had to be a lens, but I was thinking fish eye, but only because that was the only one I had a good idea of how it worked. I knew about wide angle, but never thought of how people would use it outside of landscape shots. Just amazing what different lenses can do! This will also help the wolves too. This is a very common myth, so thanks for dispelling it! Thank you, Ralph, for this article. I recently received a video of a “killer wolf” which was supposedly on a rampage for lambs and children. The video was clearly not taken in the U.S. and the men in this video were of Arabic descent. Wolves do not deserve the bad press, and neither do the coyotes. Life for them is difficult at best without making false statements and photos. The next thing you will see is some crazy emails and posts circulating video of the werewolves in the Twilight Movies as footage of “real giant wolves” attacking humans. Yes, I admit I have watched these movies. Thank you, Ralph, for this article! To add my comments to the discussion, as a sidebar. I wish that Idaho state management officials would do more to counter the patently false claims and altered images that seem to circulate endlessly and that promote the notion that wolves kill for sport, that they present a serious threat and to their communities and citizens. I am disappointed because I have called the Idaho Fish and Game Service many times and I have also communicated with some of the Commissioners who have provided me with misinformation about the number of wolves present in Idaho, and the threats they present. I have an ongoing discussion with one of the commissioners who I will not name. I think it would do more harm than good. Suffice it to say he apologized for the mistakes in the info he gave me but if I had not done my homework, I might have believed the information. It would have been easy for someone looking for a reason to be nervous about wolves to find one. I have had similar experiences with Fish and Game staff. I think this is a real problem with the Commissioners and the Fish and Game Service, they use information to stick to the old paradigm of wildlife management that calls for killing of predators as the first line of defense instead of using methods to reduce predator human conflicts, or providing science-based education about the importance of wolves within their ecosystems to counter wolf hating diatribe. They also do not work to utilize non lethal methods of control. A an example of the misinformation I have received from IFG, I was told many things including that I am not from Idaho so would find it hard to understand the impacts of wolves on the communities. I was told that wolves were encroaching into people’s territories and that only hunting would keep them at bay. When I asked why they used traps and snares which do cause horrific pain and suffering, I was told wolves are hard to find and avoid people so it makes them difficult to catch, therefore they need traps, snares and helicpoters. So which is it, there are so many wolves they are overtaking the human inhabited areas or they stay so far removed from humans that they are hard to catch? In any event, the USFWS and the state managers claim to use science but those of us who read about trophic cascades and the importance of wolves and predators in their ecosystems find it hard to swallow the science that supports models for wildlife management that do not adequately take into account all stakeholders, including those of us who want to see our wildlife alive, those of us who do not favor one species over another for political expediency, and those of us who do not trust agencies who allow people that hate animals to kill them for sport and to kill them down to the minimum allowed before triggering another listing. Its also hard to trust agencies that seem to do little to dispel the myths about wolves as killing machines. I was also sent an image by an Idaho commissioner after he received a comment I made in opposition to killing the Lolo wolves. I believe that image is one of the images referred to in this thread. It was four dead huge wolves being held up by some men. The commissioned was trying to make a point that the wolves are big and dangerous and explained that a neighbor’s daughter had been killed by a wolf in Alaska. I looked that up and it was true but I also researched the following about fatal wolf attacks in North America. Fatal wolf attacks on humans in 2000’s in North America including Canada where there are many more wolves. (1 in 2010) and (1 in 2000 )but there is much controversy about whether that attack was actually a black bear attack. In all of the time between 1900 and 2000 there were only 4 other fatal attacks in all of North America and 3 were the result of pet wolves on a chain or from wild wolves being kept but not habituated to humans. So that makes 2 attacks by wild wolves in 100 years. That’s not a lot. 88 from 1900 to 2000.
the point is rather then respond to my concern about why the wolves are being targeted when there are many factors at play, misinformation was sent that perpetuated the stereotypical bad wolf thinking. This kind of information does nothing to instill trust in the Idaho system. “Even cougars have killed many more people than wolves. Yet wolves are vilified and feared. As a commissioner of wildlife you must advance science if a sound dialogue is to begin. A response to this person (the one who sent you the images) might include the information about the number of wolf attacks and also to comment that wolves are normally fearful of people and keep their distance. You are correct it would be nice to set aside our differences and work to a common goal of conserving the environment. But truly without wolves, the environment is not healthy. And its hard to trust management of an animal when the management plans call for killing off all but 150 of them in a state that is the size of New England. You asked how I feel and whether or not we should have wolves over caribou? I believe that predators, especially wolves and coyotes, have been persecuted and eliminated as evidenced by their extinction in the early to mid nineteen hundreds and I do not trust people to manage predators unless they can demonstrate non bias. I do not believe that animals that are not eaten should be hunted as trophy game, I do not understand killing something to hang it on the wall or just to kill it. I do not believe that we have healthy ecosystems where maintaining unusually high numbers of ungulates to make hunting easier is the primary reason to manage predators. I believe that if men were not involved that animal populations are self limiting, and this is proven scientifically. The theory of evolution bears this out. I also know that when prey is scarce and or wolves do not have enough territory they will allow only one pair of animals to breed. This is science. Killing wolves indiscriminately and without regard for pack structure is not good for the ecosystem or for the pack. Finally killing any animals using traps and snares is barbaric and unusually cruel. I would hope that Idaho will stop this practice as a majority of people in the US as well as in Idaho do not believe in traps and snares. I do not say this lightly either. I set out to prove a hypothesis about wolves, hunting and trapping and to see what people think of the issue in Idaho. So I collected all of the 17,000 plus comments that were received in response to your online request for comments and I am cataloguing them. As I move through them, albeit slowly, I have categorized them according to several categories, where the person lived and whether they are a hunter or not, whether they support hunting of wolves or not and if they do did they support trapping and snaring. Thus far I have made it through 100 pages of the comments (from the general solicitation not the invited hunters responses yet). As my co volunteer states comments in support for trapping and snaring are far and few between. Even hunters are against it. Its just cruel. And there are far more comments against hunting than for it. In any event, I will be sending you the spreadsheet when we are competed sorting the comments. I think you will be surprised by how many people enjoy seeing their wildlife alive. In my mind, its hard to trust Idaho, Montana and Wyoming until they can demonstrate that they are willing to let science instead of politics and a culture of fear based hysteria related to wolves, drive their policy. Furthermore, the use of a non germane rider to remove species from the ESA with no judicial review bypassed our democratic traditions, and further makes the intentions of the western states, in managing wolves suspect. Instead of working to create trust with the public these agencies forget to correct those who use incorrect data, hype and fear baiting tactics. Why should people who have websites like Save Western Wildlife be allowed to hunt? Go to this website and if this does not send shivers up your spine I don’t know what will. There are many like it. If citizens demonstrate ingrained bias and hate toward wolves then the Agency purportedly managing them should have a mandate to protect the species until it can be demonstrated that this hate and bias is not a threat to the species. If you want us to trust you to manage your wildlife, that many of us see as a national treasure, then you need to be honest and to look at plans like Washington state’s that placed a value on wolves as part of the ecosystem and that used all their stakeholder input to develop the plan. Its time for a new paradigm of wildlife management and for predators. One that allows them to be thought of as something other than to be “harvested”. There are many people in this country that agree with you. The whole wolf debaucle in the West has been an embarrassment- the whole rider issue being just one of the issues…. and curiously now some on this blog(They know who they are) are even blaming activists and “environmentalists” as the cause for this return to the 1920s with regard to wolves and predators in general. Misinformation and hysteria propels legislators to act, in areas they have no business acting in. Leave it to the scientists. I very much liked the comment about setting aside lands free from hunting. Imagine living in a world where every year, year after year you were chased with guns, bows and arrows, and hunted so someone could claim they caught you. Its an oversimplification for sure but we need places where animals are not hunted and those of us who like to be outdoors can also enjoy our solitude free from the sound of rifles or fear of seeing an animal killed. Why is it that all animals are just there to be harvested? Its an old tradition that like slavery, needs to be rethought. There are a great many people who want to enjoy wildlife and see them unmolested. I am not in the minority anymore. Good Luck trying to set aside hunting free public lands, congress has not set aside additional wilderness in the Northern Rockies for many years, let alone declare federal lands free from hunting. It ain’t going to happen for the next 50 years. I do believe that people need to fight for what they want. If we want the system changed then we need to send consistent messages to our legislators, and push to have our voices heard. I drafted legislation once that provided for greater controls over tankers carrying oil. If you think the lobbyists for ranchers and cattlemen are strong, the oil lobby is pretty intimidating. Believe it or not the best time to push legislators is when there is a catastrophe. The oil spill prevention statute that we passed was done so right after an oil spill in Rhode Island and I was a policy analyst there. If we want land set aside for wildlife and to see wolves and other predators given better protections then its time to keep the pressure on. The states are proving that they are not doing a good job of managing wolves fairly. I am working on a policy initiative and to find a sponsor for it in the Senate, any one that has done this work and wants to hear more you can contact me. I am also looking for volunteers as we are counting and cataloguing a tremendous number of comments to give us facts to show what the majority of the public really does want when it comes to wolf management. Am I allowed to post an e mail? I am doing this work as I am tired of signing petitions and calling my senators and feeling disenfranchised. I hope you are wrong about it ain’t going to happen for the next 50 years. It is one thing to introduce a bill in congress it is another thing to get it to the president’s desk. Western U.S senators are going to stop any anti hunting bill, you know that. The country is going to have to change directions and the direction that I see it changing is not going to be favorable for wolves or wilderness areas. If you want areas without hunting try the Beartooth Mountains in November. We were in the Beartooth’s last November hunting mountain sheep and never saw another hunter, human or wildlife watcher. Over 99.9% of people are not tuff enough or have the equipment to be in those mountains in late November and I am getting to be one of those 99.9% or will be in the next couple of years. Since when has slavery ended study up on current news slavery is alive and big Dollar Industry. If the wildlife viewers are the majority then form a group raise your own money and buy one it’s the american way. But first prove your the majority by forming a group with members. You got that right. It is a sad irony how widely enslaved people are in the home of the brave and land of the free. But, what else is expected when you live in a country that brags about being a nation of laws? Checked our prisons lately? Every time sportsmen go to the field they almost need to bring an attorney to interpret the rules, and keep them out of trouble. This scenario can be applied to many situations these days. If authorities could follow any person in this country, around for a week, it is highly likely they could find a violation of some kind of regulation for something, often without the person even knowing they were doing it. Why do we have so many rules? Sure, more people, bigger groups need some boundaries, but adding yet more laws on top of laws, hardly spells freedom. Maybe it is natures “trap” for people. Catching us, as we like to catch wildlife. Cosmic reciprocity, of sorts, perhaps? I am doing exactly as you suggested. I am in the process of finalizing a start up organization called Justice for Wolves. As you have read, it’s my contention that federal and state managers do not play fairly when it comes to using stakeholder’s input. I also do not believe that the comments that are received in response to solicitations, are integrated into wildlife management plans consistently, at least in Montana, Idaho and Wyoming. I think that the paradigm that calls for killing predators, in response to cattle and ungulate depredations, for wildlife management is outdated and that many Americans do not want to see state or federal funds used for trapping, snaring, poisoning or shooting wildlife. To learn whether my theory is true, and to quantify the subjective evidence that I see via the vast number of wildlife enthusiast websites, outdoor retailers, outdoor and travel publications, tourism related to wildlife viewing, photography blogs etc, we intend to document facts to support our contention. We have started by looking at the comments made to Idaho F&G to see what people are saying. The comments are being sorted in excel according to the several classifications i.e general solicitation, invited hunters ect that Idaho used. Idaho’s online solicitation included a general solicitation as well as an invited hunters solicitation. I am doing this because I was unable to find any document that summarized the comments other than a one page summary that outlined the range of comments. If one exists I would be happy to learn of it. To date, we have catalogued more than 2000 of the comments in the first 100 pages that were received by the public in response to Idaho’s wolf management plan. The first two hundred pages show that even in wolf-conflicted Idaho the public seems to be overwhelmingly concerned about wolves being managed too severely, and many are especially not in support of trapping and snaring, and/or want wolves to be a part of the landscape. Its difficult to determine what portion of the comments are from Idaho only because they are mixed into the general solicitation. However, we are noting the state of the responder when possible. Of note is that in the invited hunter solicitation many hunters are concerned that the wolf management plan is too severe and or do not agree with trapping. I was surprised and relieved to see this. Of particular note many responders were angry about the bias evident in the solicitation. I have not completed the catalogue of comments yet, but we are working hard to have the 17000,00 completed in the next two weeks. It will be interesting to see if the public’s input went into designing Idaho’s wolf management plans and if a value was placed on the majority opinion? It does not appear to be the case but its still too early to tell. For those of you ready to attack my qualifications, I am a JD and have an MA in marine science and policy. I worked in Washington on the essential fish habitat regulations and was part of a team cataloguing comments for the federal government. I come to the issue of wolves, however, as a professed lover of wolves and wildlife, saddened and perplexed by the continued intolerance of predators and especially wolves. It does not take an advanced degree to have compassion, to want to see landscapes untouched by escalated killing policies, and to wish for a different approach to the management practices that use our tax money to kill the wildlife that they profess to conserve. Look at the US Fish and Wildlife mission statement on the website. If anyone would like to see the results from the Idaho comments, I would be glad to post. For those of you interested, Justice for Wolves, will be using volunteers from a wide variety of backgrounds. It is a grassroots movement to collect data and to funnel that data to federal legislators, NGOs already working on the issues, and to produce educational materials that states can use to engage and educate citizens about what the polls, petitions, comments and public records state. We will also be looking at revenue from consumptive vs non consumptive uses. The website Justice for Wolves should be up in the next month. It will be directing people about how they can take action to protect wolves and predators in simple effective ways or how they can volunteer to take on a specific research related task. Many people feel disenfranchised and do not know what to do. I hope Justice for Wolves will help people find a voice. We also want to target getting the issue publicized as best as we can through advertising, lobbying efforts, celebrity, artist, photographer, and musician involvement. The majority voice is not always the voice that is paid attention to in this country, especially when corporations are now treated as citizens and big money goes into lobbying efforts to thwart and bypass democracy, but that does not prevent those of us who want change to work our hardest to get it. So I am doing something! i don’t believe it will be easy or fast. I do believe there is a much better route to managing and living with wildlife. A path that does not include killing as the first action to be relied on. Again, please take a moment to look at Washington’s wolf management plan that calls for integrating education, for reducing human predator conflicts, and for compensation for depredated livestock as wolf management tools. Washington wisely used their public’s input in designing the plan. Hopefully this is the tide turning. Its been a mockery of our democratic process to have a non-germane rider remove wolves from the ESA, and then to prevent judicial review. There are quite a few areas that have been set aside and don’t allowing hunting. They are called National Parks. Currently they comprise over 83 million acres. You need to check your facts about the National Parks. As is what way Louise? I know of no National Park that allows hunting, there are however areas under control of the Dept of the Interior that does allow hunting. As far as the lands the 83 million acres number come directly from the National Park Service. Excuse me, I will correct that statement, there are areas in Alaska that some hunting is allowed. 16% of the 300 + NPS units (including Seashores) allow hunting. Most people’s vision of NPs are the large western ones that don’t allow hunting but compromises to allow the creation of recent ones (a good example would be Cape Cod National Seashore) was to allow hunting. To me, personally, not allowing hunting is one of the per-requistes to a National Park so I have a tough time believing in the NP mandate where hunting is allowed. National park units is a bit of a different definition that actual National Parks, as I said, there are lands under the control of the Dept of the Interior that do allow hunting. I agree though we are splitting hairs here! Grand Teton Park in Wyoming is also hunted. And grazed. Most national parks, monuments, and other federal reserves were set up for a particular preservation purpose. Unfortunately, at the time many were established the needs of winter range, encroachment (or existing) human land use was not adequately considered. The absence of large predators in adequate numbers to keep some prey species at or below the land carrying capacity may not have been practical or even possible. Thus hunting was/is the solution to deal with the population dynamics. I doubt, for example, the elk problem in Rocky Mountain National Park, the newly created Sand Dunes/Baca NP/wildife refuge will ever be solved with the addition of wolves because of adjacent human land uses. Thus the problem remains, unless hunting or sharpshooters are brought in to control ungulate numbers. Same thing is true on other lands. I have mentioned here before issues associated with the Air Force Acadamy in Colorado Springs, or the privately owned, but security necessary, Boeing Company complex in Tennessee, where deer populations create problems. You might find individual national park mandates lacking when allowing hunting, but again, national parks have many personalities for which they were created, not always centering on the untuoched natural environment, and even those that do have their own history of prior human use (why some NP’s allow hunting) which Congress has seen fit to honor when creating the national park reserve. Same is true, for example, with other federal reserves under Interior – wildlife preserves, national monuments etc. under BLM administration (Canyons of the Ancients is one example). Yes it is, but Grand Teton is a bit of a unique situation, those stipulations were included in the creation of that park, without those stipulations, there may not have been a Grand Teton National Park. WM just as an FYI Rocky Mountain has no elk problem any longer (if they ever did). Culling is done to keep the program in place in case it’s needed as much as anything. Imagine if Yellowstone had been as sensible.